The Daphne odora varieties are the very sweetly scented ones, very popular for picking. 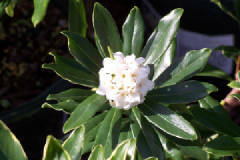 Daphne odora alba has a pure white flower and Daphne odora rubra has reddish buds opening to deep pink, and is a lower more spreading bush than leucanthe. 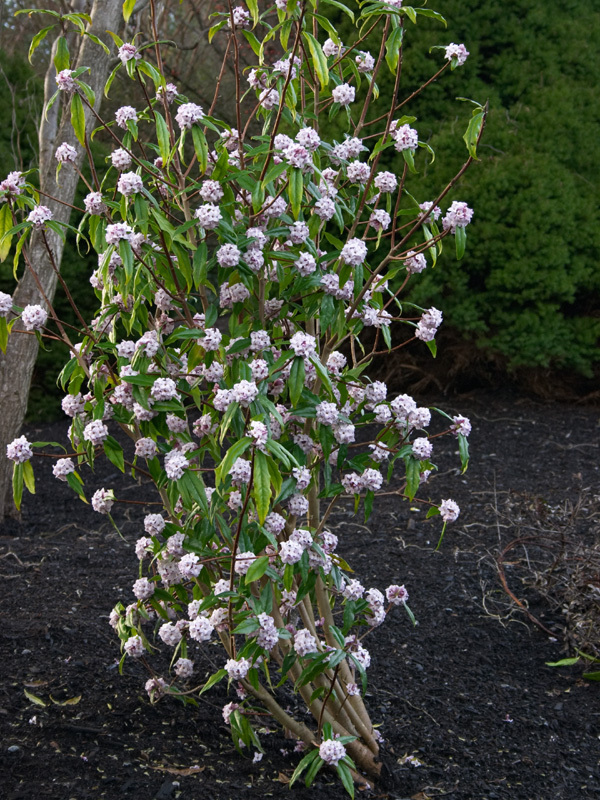 Daphne burkwoodii is a twiggy, densely foliaged evergreen (or semi evergreen in cold areas) with matt mid-green foliage and masses of small starry shaped, fragrant, pink flowers in spring. 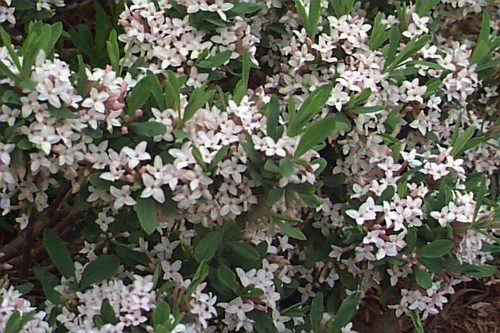 Then there is Daphne bholua (Himalayan Daphne) that can grow up to 3m tall, but narrow making it suitable where there is not much room but you want some height. They have an open habit and the same fragrant flowers but flower much earlier than odora. While Daphnes can grow in the sun, they like a moist soil, so that’s why they are often best where there is some shade. Mulch the soil well to retain the moisture, but a free draining soil is imperative as water logging will kill them. Feed well with an acid fertiliser particularly in autumn when they need it for flower production. Daphne ( /ˈdæfniː/; Greek: Δάφνη, meaning “laurel”) is a genus of between 50 and 95 species of deciduous and evergreen shrubs in the family Thymelaeaceae, native to Asia, Europe, and north Africa. They are noted for their scented flowers and poisonous berries. This entry was posted in Flowers, Shrubs, Spring. Bookmark the permalink.